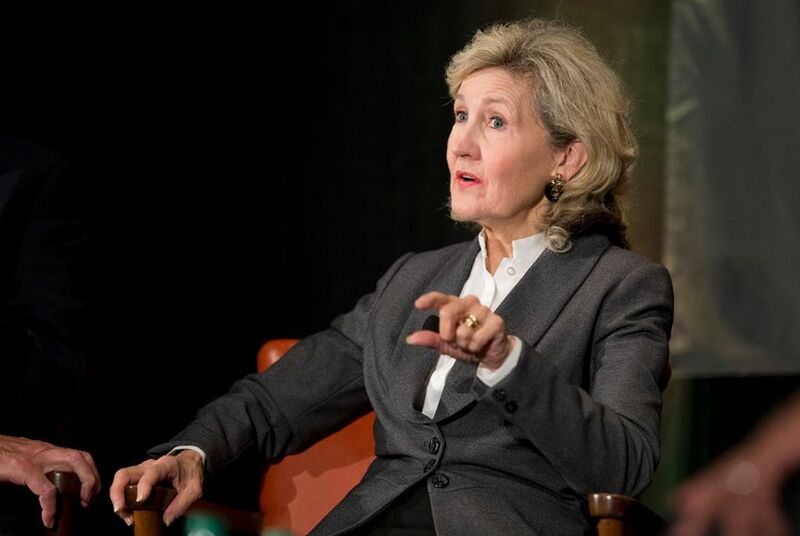 Before meeting with state and higher ed leaders, UT-Austin President Greg Fenves and former U.S. Sen. Kay Bailey Hutchison said Monday that universities, state governments and the private sector need to take action to preserve public colleges' strengths. Lamenting the shrinking state support for higher education in Texas and across the country, University of Texas at Austin President Greg Fenves and former U.S. Sen. Kay Bailey Hutchison said Monday that universities, state governments and the private sector must act to preserve public colleges' strengths. Cooperation is needed, Hutchison said, to "protect our universities' capabilities to do great things for our students and our nation." Hutchison and Fenves spoke in Austin with a group of reporters before meeting with state and higher education leaders, including Texas House Speaker Joe Straus, about the issue. They planned to present a report that said state funding of public research universities has dipped 34 percent nationwide in the past decade. Flagship universities aren't immune to that trend. State funding now makes up about 12 percent of UT-Austin's budget, compared with a peak of 47 percent in 1984-85. The report was compiled by a group organized by the American Academy of Arts and Sciences. Hutchison, chairwoman of the Texas Exes board of directors, served as an adviser for the report. Fenves wasn't involved but hosted Monday's meeting and said he is "very supportive" of its goals. The project's co-chairman, Robert Birgeneau, argued that the decline in funding has hurt state flagship universities the most. And he said it is the main reason that universities have had to sharply increase their tuition in recent decades. But tuition increases can't continue indefinitely, Birgeneau said. So the report urges state leaders across the country to "reverse cuts made over the last decade." Cuts were made in Texas as the state struggled to balance its budget during the height of the economic recession last decade. Lawmakers have also said rising costs for other state needs, especially Medicaid, have taken dollars that might have otherwise gone to higher education. Monday's meeting was held during a time that university budgets have gained the attention of some Texas lawmakers. Most of Texas' major public universities are planning to increase tuition for the upcoming school year. That has caused some lawmakers to express support for the Texas Legislature retaking control of how tuition rates are set. Lt. Gov. Dan Patrick has asked the Legislature to study the idea, expressing frustration with the schools and noting that state appropriations ticked up for higher education in 2015. On Monday, Birgeneau acknowledged, "We are not going to go back to the era where the state provided 50 percent of the university's budget." So universities also need to look for new revenue streams, he said, to keep themselves robust. Meanwhile, Fenves expressed skepticism toward the idea of the Legislature regulating tuition in the future. "The current system with the boards of regents [setting tuition costs] is the right approach," he said. Disclosure: The University of Texas at Austin and Texas Exes are corporate sponsors of The Texas Tribune. A complete list of Tribune donors and sponsors can be viewed here.